If you have always dreamed of elegantly waltzing through a festively decorated ballroom, look no further! The Viennese Concordia Ball may be just what you have always been searching for. First celebrated in Protected content , it soon became an annual highlight, to the extent that even Johann Strauß dedicated several waltzes to the Concordia. The Protected content Ball on June 14th celebrates Italy's cultural diversity and richness under the motto 'Una Notte Italiana'. The Viennese Opera Ball orchestra and pt Art orchestra will fill the ballroom with classic dance music, while Italian pop music will be played in the arcade yard by CHOSN aka DJ L. Rock. Grab your dancing shoes on June 14th Protected content , dress in your best gown and enjoy a stunning experience in the home town of the Waltz! Gentlemen: Dark tuxedo, dinner jacket, military uniform and bow tie. The ball committee reserves the right to refuse entry to any guest who does not honour these dress rules. Entrance tickets to the Concordia Ball: € 95,00. Discounted tickets issued to students and trainees: € 40,00. Are you attending the Concordia Ball with a group of friends but without a dance partner? Are you going with a partner who enjoys the atmosphere but is not necessarily enthusiastic about dancing? Do you have any favourite dance but no companion for it? Or would you simply like to dance with a different gentleman? The Concordia Ball offers an 'Isle of Men' – outstanding dance partners will be available to dance waltz, foxtrot, tango, cha cha, rumba, samba or boogie with our female guests. 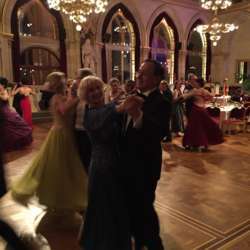 Press Club Concordia, an organisation of Austrian journalists and writers, has been holding a traditional Viennese ball at the Vienna City Hall for over Protected content . As one of the few summer balls in Vienna, around 2,000 guests attend every year, including well-known representatives from politics, business, arts & culture and the media.